October is Breast Cancer Awareness Month! We would like to encourage all our Tigers to come dressed with a pink shirt, jeans and pink accessories for $1 tomorrow. 100% of the proceeds collected will be donated towards breast cancer research. 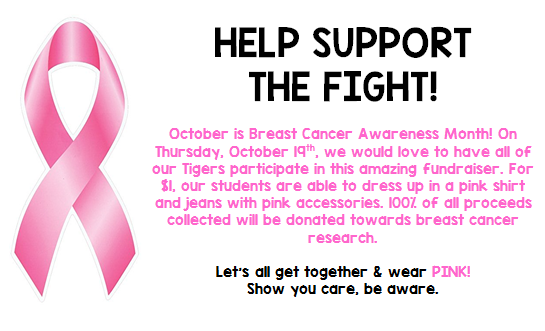 Help support the fight and show you care! This entry was posted in Uncategorized on October 18, 2017 by APA Front Office.